UN38.3 certified batteries guarantee high security standard and conform to IATA regulations. Browse our range below. 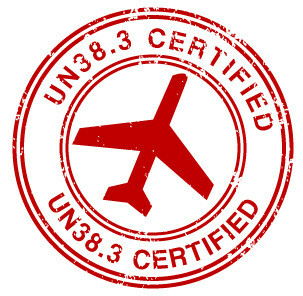 UN38.3 certified batteries guarantee high security standard and conform to IATA regulations. Altitude test: Simulation of air freight at low pressure and at a variety of temperatures. Heat test: Simulation of quick variations and extreme temperature changes from -2°C to +75°C. Vibration test: Simulation of the different types of vibrations that the battery could be subjected to during transport. Shock test: Simulation of the type of impact the battery could be subject to during transport. Short circuit test: Simulation of external short circuits to which the battery could be subjected. Impact test: Simulation of impact with a given weight. Overcharge test: Simulation of overcharging the battery and evaluation of its reaction to this.